+ 8 Holding nothing back! So, the numbers are rising still… Great news! Leuk 0.66, that’s up from yesterday’s high of .16, so some engrafting has been a happin’ here. 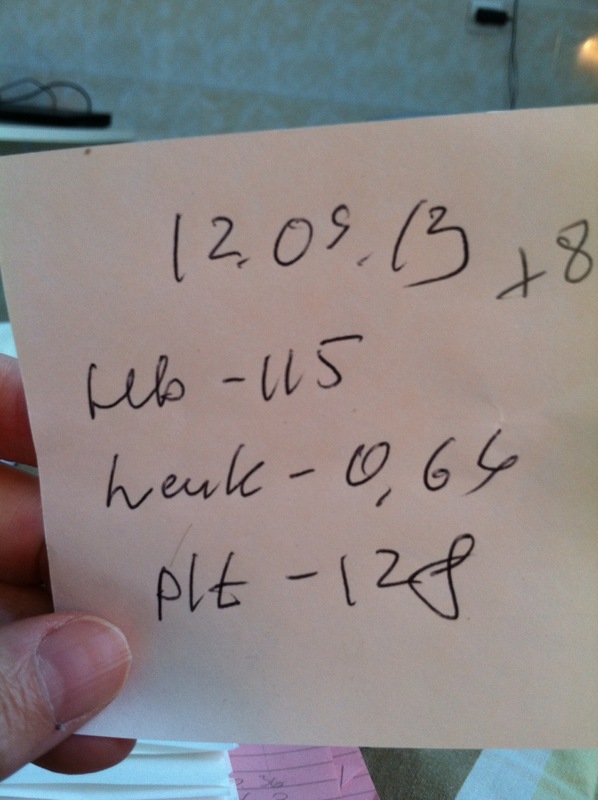 Dr. F was very pleased and said that I should start to transition out of total ISO by Saturday! That would mean my clothes back. As much as the gown is so beautiful and all, I am ready for some of my own jammies and clothes. And, to be able to walk outside soon, and feel the cool fall air on my face, would do world of good. Last night I had the cold/sweats, not comfortable at all and very difficult to sleep. All part of the engraftment, so a small price to pay. I’ve still been very blessed with no pain, which is a very normal side effect of the engraftment. So, I’m prepared for it, if it comes. Hair watch… It’s a flying out left and right. I think it’s time for the hair net, it is flying out everywhere, you should see the shower when I’m done. Poor cleaning lady. I have a nice little bald spot going on the side I can sleep. A little difficult to sleep on my normal side with Marvin in the way, so I’ve had to adjust. And we really can’t make this stuff up about the food. I know what it looks like, and it smells just as bad. 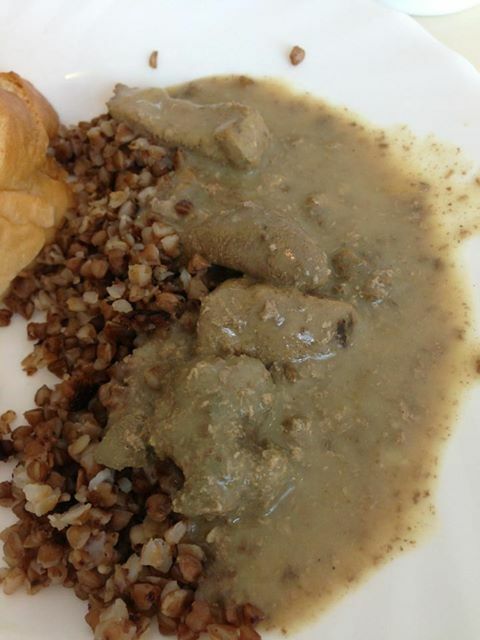 I truly think it’s left over tongue from yesterday, with some type of gravy and barley. Thank goodness they usually serve a soup with lunch, or I’d really be in trouble. The soup today, though, not one of my favorites, but better than this option. I really make the most of the breakfast, it goes down hill from there. I may not be a “Brick House”, but feeling pretty good today! So, get your groove on. Previous +7 – Up Up and Away! Next +9 It’s a Beautiful Day! I bet you will really appreciate you own food at home…………ya think? Won’t they let you electric razor cut the hair off so you don’t have to deal with the hair mess? You are gonna be so glad you did this! My wife Wendy Nash(CIDP-Chicago) is so glad and said “IF I knew I had to do this again some day in the future I would do it in a heartbeat!” God be with you! I think they want to get me out of ISO to do the final shave, so not chance of infection. Thanks for you and Wendy’s support, it means so much. And, yes, real food will be so good! Can’t wait for my first home cooked food at home! And mostly to be home. Hey Girl! Congrats on the continued progress!! Great news, and even better you will be out of iso in a few days — I know you are anxious to be up and moving! And geez — the food — what can I say except you must be losing some weight which means you won’t have to hold back on all the good food your hubby will cook when you get home! What do you think your first meal request will be? Yeah! Great to hear of your progress. In our prayers. Girl I love me some Brick house. So proud to see your numbers today. But was sad to see the food pictures…lol WOW that stuff looks awful. They need some southern cooks…lol Cant wait to see you in Little Rock. thanks for keeping us posted, you know our prayers are with you.